The daughter of Rep. Maxine Waters (D., Calif.) was paid nearly $70,000 by her mother's campaign during the 2016 election cycle. Karen Waters has been on the payroll of her mother's campaign committee, Citizens for Waters, since 2006. She has pulled in more than $600,000 for her services since that time. Karen is in charge of endorsement mailers, known as "slate mailers," for her mother's campaign. The slate mailer operation has generated hundreds of thousands of dollars for Waters' federal campaign committee in recent years. In order to appear on a Waters' slate mailer, candidates for political office must pay Citizens for Waters from their own political committees. If a candidate does not directly pay Waters' campaign committee, they must credit their own campaigns with in-kind contributions from Waters. 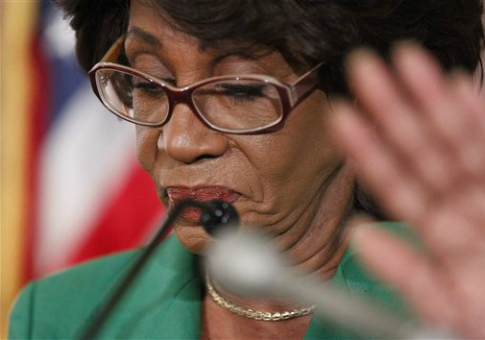 The mailers are sent to almost 200,000 constituents in the South Central Los Angeles area, where Waters holds considerable sway. The mailers consist of an "official sample ballot" with quotes from Waters about candidates and measures she supports. Waters' campaign received more than 20 payments totaling $297,500 for slate mailer endorsements in 2016. The largest payments, worth $35,000, were made by the Democratic State Central Committee of California and Yes on Measure M, a group that pushed for an interconnected transportation system in Los Angeles. Measure M was approved with 70 percent of the vote on Nov. 8. Democrat Kamala Harris, the former California attorney general who won a seat in the Senate this November, paid Citizens for Waters $30,000 to appear on the endorsement mailers, campaign finance records show. This was not the first time Harris has paid for Waters' endorsement. Harris made two payments totaling $28,000 to Waters in 2010 to appear on the mailer when she was running for attorney general. A number of California ballot measure groups and judges also paid Waters tens of thousands for her endorsement this past election cycle. Prior to 2006, Karen ran the operation from a state committee called LA Vote. The Federal Election Commission issued an advisory opinion in late 2004 stating that Waters could run the slate mailers through her own federal campaign committee. The Washington Free Beacon reached out to Waters' office for comment on the payments last week but did not receive a response.